The owners were very helpful! Be nice to Donna and she will treat you in kind. She gave us great tips on where to go and was great to deal with. She even watched our bags for a while after we checked out since our flight didn't leave until much later. The room was much bigger and nicer than expected with a great view of the Esplanade. There was a washer and dryer in unit that worked well, and there were ceiling fans in both the living room and bedroom to help circulate air. The property is adjacent to the Esplanade, which makes it very convenient to go for runs/walks along the shore in the mornings. Nice units, property managers nice and friendly. Ground floor units are better. Great location. Management extremely nice. As a local I would use this Esplanade CBD location again. The 1 bed, 1st floor apartment was well equipped and comfortable. Having our own laundry was an added bonus. The proprietor (Donna) was extremely helpful. The location while approx. two klm from Cairns central was good, and access to the Esplanade was excellent. View of the gardens, pool and esplanade was excellent. Keep in mind there are no lifts so depending on age and fitness choose your room carefully! 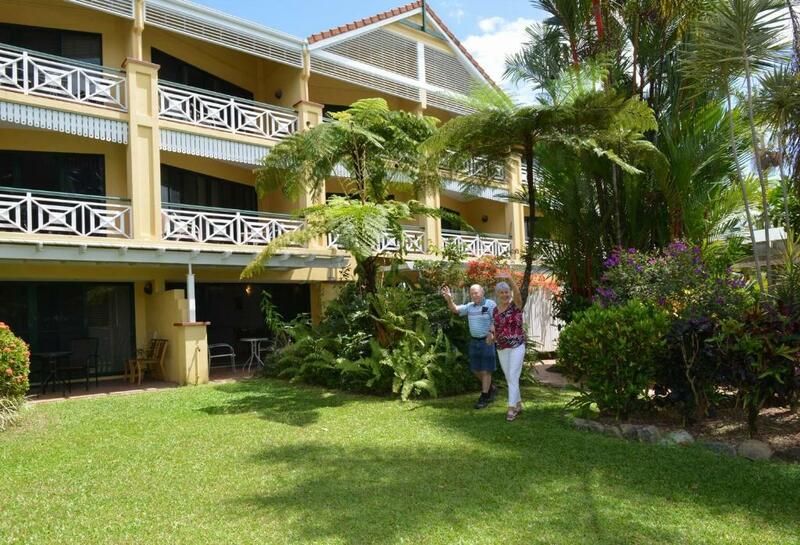 It was a very comfortable apartment and Donna the manageress was extremely helpful in helping us visit some wonderful areas in and around Cairns and helping us settle in. In the apartment we had two TV’s. kitchen with microwave dishwasher and oven with two hot plates There was also a washer and dryer which was great as we stayed for two weeks. A great location and we could walk down esplanade to downtown in 20-25 minutes A lovely pool in the grounds of Waterfront Terraces too. 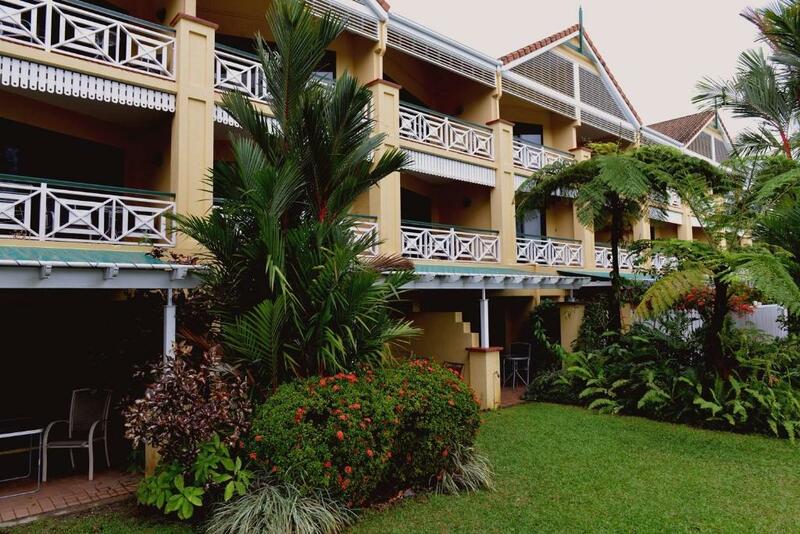 Spacious, comfortable apartment with well equipped kitchen and laundry and very comfy bed.. located on the esplanade with great view of Trinity Bay. Very friendly and helpful owners, in particular Donna.. we really enjoyed our stay here. AC was good. Kitchen stove was adequate (five of us cooked a full fledged brunch). Kitchen supplies were very adequate. There's a friendly grocer 15 min walking distance from the apartment, open late. Walkable to the esplanade/city center, beautiful walk. Lock in a great price for Waterfront Terraces – rated 8.2 by recent guests! 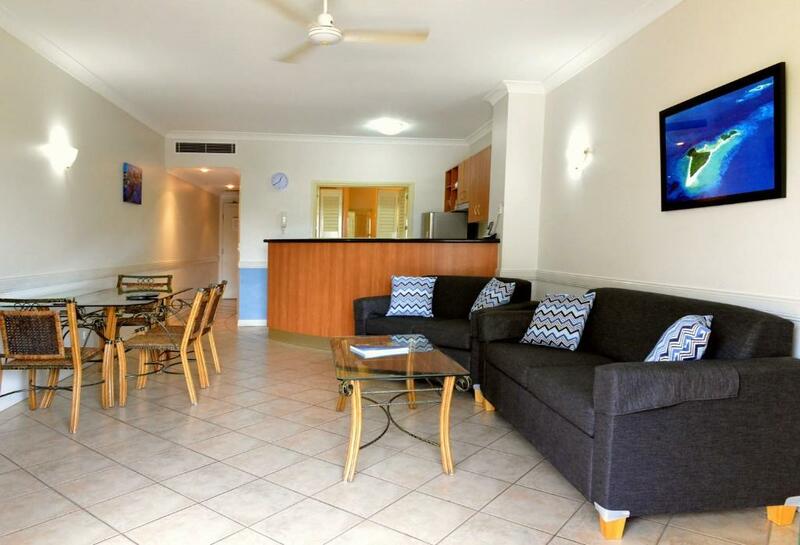 Waterfront Terraces This rating is a reflection of how the property compares to the industry standard when it comes to price, facilities and services available. It's based on a self-evaluation by the property. Use this rating to help choose your stay! 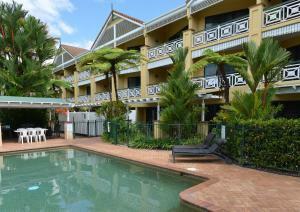 Waterfront Terraces Holiday Apartments offers comfortable accommodations in a unique position on Cairns Esplanade. 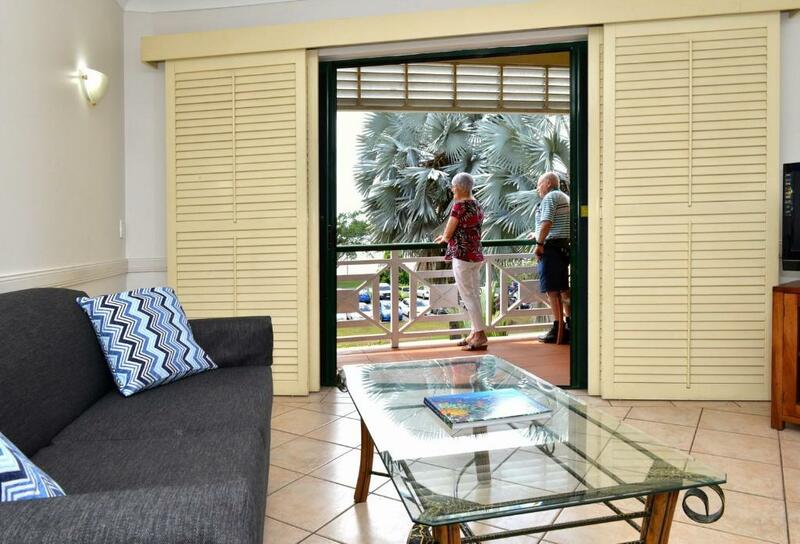 Waterfront Terraces is a Queenslander-style building that provides fully self-contained apartments overlooking Trinity Inlet and the parkland foreshore of Cairns Harbor. 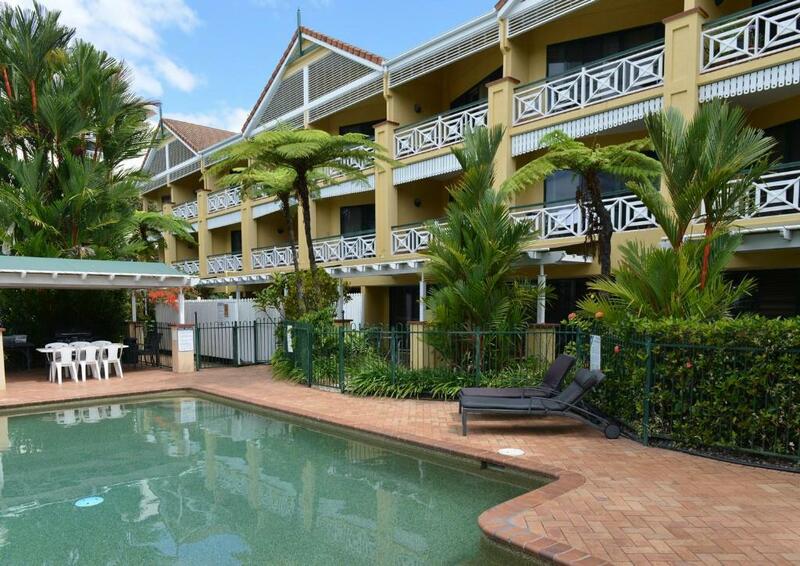 Surrounded by stunning landscaped tropical gardens, this property is within easy walking distance of the Cairns CBD, and close to major Cairns attractions such as the Great Barrier Reef, Cape Tribulation and the Daintree National Parks. When would you like to stay at Waterfront Terraces? 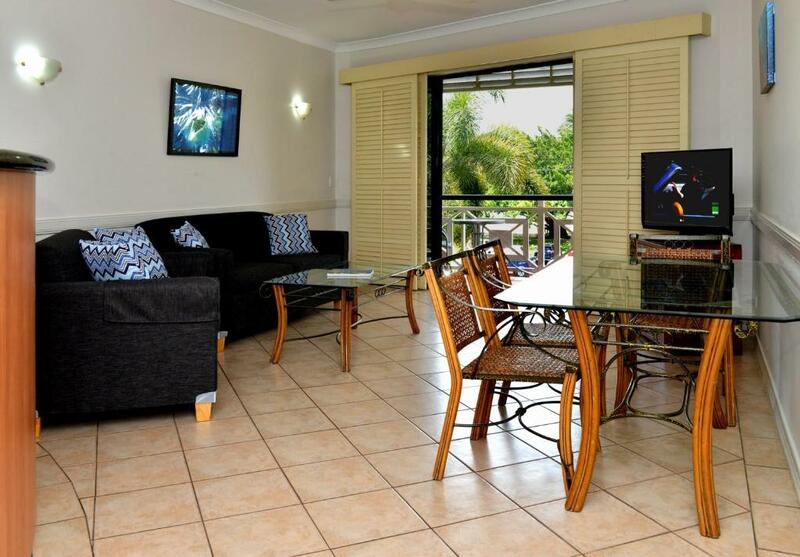 This fully self-contained apartment has a patio or a balcony. It has a full kitchen, laundry facilities and satellite TV. This fully self-contained apartment has a balcony. It has a full kitchen, laundry facilities and satellite TV. House Rules Waterfront Terraces takes special requests – add in the next step! All children under 2 years are charged AUD 8.80 per night in a crib. All children under 16 years are charged AUD 18 per night for extra beds. 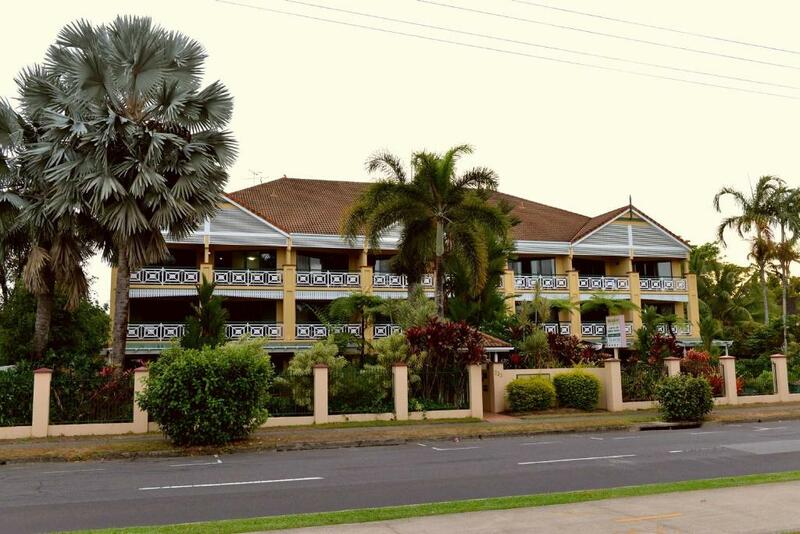 Any additional older children or adults are charged AUD 28 per night for extra beds. Waterfront Terraces accepts these cards and reserves the right to temporarily hold an amount prior to arrival. Guests are advised to inform the hotel beforehand of late check in or check out times. Please note that housekeeping service is only offered for stays of more than 7 nights. The reception closes at 17:00 Monday to Friday and at 12.00 on weekends and public holidays. If you are arriving after office hours, please contact the hotel for check in instructions. Their contact number can be found on your booking confirmation. Please inform Waterfront Terraces of your expected arrival time in advance. You can use the Special Requests box when booking, or contact the property directly using the contact details in your confirmation. No Austar Air conditioning in the 1 bedroom apartment did not work properly. My partner had to sleep on the lounge to keep cool. Stairs narrow and step. It's a self-sustained condo, so be prepared to clean up after yourselves else incur a cleaning fee. This place isn't quite a hotel in that respect. That's not a problem per se, just something to be aware of. The planes overhead took some getting used to, but I did enjoy watching them leave while on my walks! Apart from that, being at the Northern end of the esplanade meant less other noise and congestion. 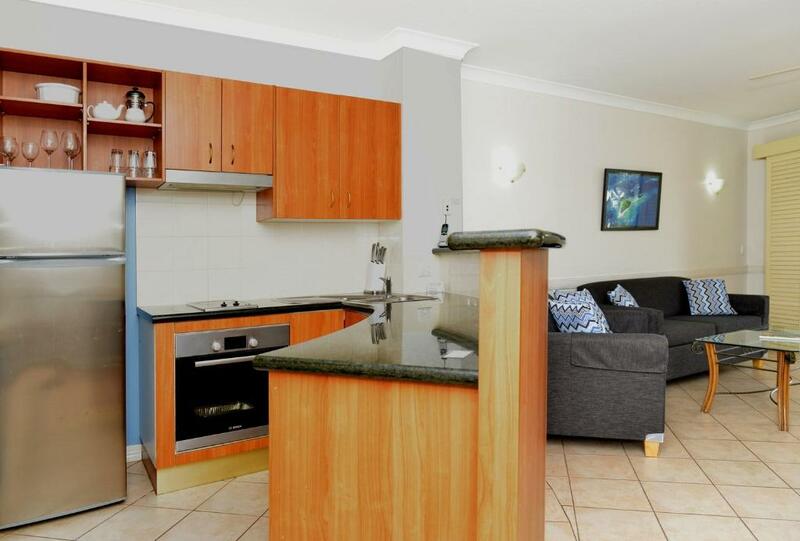 The apartment was a little jaded and could do with a little brightening up. but very comfortable and clean The only downside was being iunderneath the flight path with lots of plane noise at times. Being a walk-up property the stairs were a bit of a work out.. It would have been nice to have more supplies of toiletries (tp, shampoo, conditioner, etc). The bathroom fan is very noisy. Bottom floor , could hear people up stairs all night . Bed was horrible so was the pillows Washing machine didn’t work , water going everywhere Couldn’t go outside as other patrons were smoking on patio and my son suffers bad asthma .